With the excitement of turning the hull all but forgotten I’m back to the fairing grind. This time it’s the deck and cockpit that are getting the attention of the long board sander. 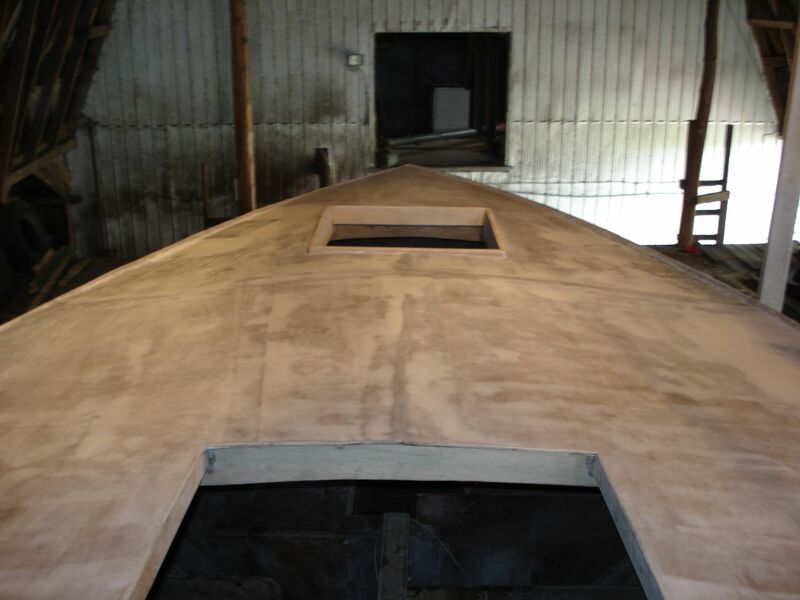 Compared to the hull I think this task is going to be a good deal easier – there’s a lot less surface area to cover and the cloth on the deck is a lighter weight which makes for smoother seams. That and the fact that I’d learned a thing or two by the time it came to installing the deck. While the fairing compound cures I’ve also been spending some time below decks completing the installation of the centerboard box. Andrew… that’s a nice looking deck! How’s the interior coming along? Is it about time to hang it up for the winter? What’s your planned launch date? The interior’s still pretty rough. I’d really like to get the thing in the water next year so the current plan is to leave the interior ’til the end and do what time permits.